In the Eternal city there is no shortage of good coffee, but would you know where to go for what most locals consider the best coffee in Rome? it is a pleasant venue, still decorated with the original decor for the 1930s and the coffee there is indeed special, as you can guess from the long queue you can often find there! Famous for being one of the best places in Rome for coffee and considered by many the absolute best coffee in town, the Eustachio cafe started as a small family establishment and soon became the favorite mid-morning stop for the members of the Senate, nearby. The Ricci brothers, now running the caffe’, are passionate about the quality of what they serve and over the years have developed a secret recipe that makes their coffee blend absolutely unique: buying only high-quality coffee from certified fair trade farms around the world, they carry out the roasting of the beans in-house using a traditional roasting technique that uses no preservatives and enhances the quality of the coffee. The coffee shop Cafe Sant’ Eustachio sells coffee beans and you can pay for them along with your coffee at the till. They come in lovely golden packages and make for gorgeous present for coffee lovers around the world. 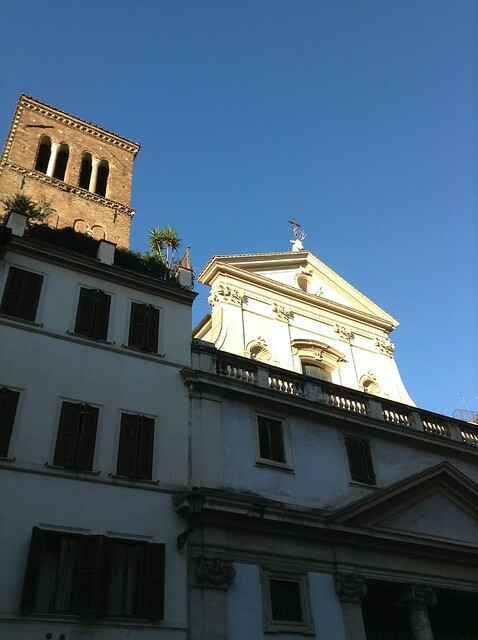 The same stag looks down from the roof of the beautiful basilica in front of the caffe’, overlooking the square dedicated, like the name suggests, to Saint Eustachio. Tradition reports that Eustachio or Placidus, as he was called before his conversion to Christianity, was born in the first half of the first-century a.D. He was a Roman and a pagan and like many male members of the Roman upper-class, he grew up in the army, reaching the high commanding grade of magister militum. In those years, Rome was at the height of its expansion and Emperor Trajan sent Placidus to lead Roman legions to Asia Minor, where he distinguished himself for courage and heroism. But one day, he had a vision that changed his life: while hunting, he encountered a stag with a cross shining between its horns. Struck by the vision, Placidus decided to convert to Christianity and got himself and his family members baptized into the new faith. In that occasion, he abandoned his roman name and took on a new one, Eustachio (meaning: he who produces good crops, or good ears of wheat, literally) that he carried for the rest of his life. But conversion to Christianity was not an act free from consequences in those times and Eustachio, after many years of mixed fortunes, eventually had to face the Roman establishment and its anti-Christian views. In pagan Rome, religion and politics were strictly connected and to prove someone’s loyalty towards the State and the Roman cause it was usual to demand that they offered a sacrifice to the Gods. Emperor Adrian, in occasion of a great celebration over the latest Roman victories, demanded to his general to partake in the festivities and the sacrificial ritual, but Eustachio, strong in his faith, refused and was therefore condemned to an agonizing death along with his wife and son. This refusal and fearless pride in his belief made him a Christian martyr and then a Saint: the church dedicated to him it is said to be built over the ruins of his family home and has, on its roof, the stag’s head and the cross that marked Eustachio’s conversion. In front of it, a frescoed wall depicts also his history. In the middle of the summer, a great alternative to espresso is granita di caffe’, a type of iced coffee. Granita is a very special treat indeed: rather than being just coffee with some ice cubes dunked in, it is a proper dessert made of ice, coffee and, depending on the specific recipes, additional ingredients such as sugar and whipped cream. The best granita in Rome can be found at Caffe’ Tazza d’oro in front of the Pantheon: it is served with whipped cream and it to die for! Caffe’ Lungo: espresso but with a little more water in it: the machine is left to run a little longer so that the drink is a little ‘taller’. This post is unsolicited and unbiased and I received no compensation for it. The opinions espressed are, as always, my own.